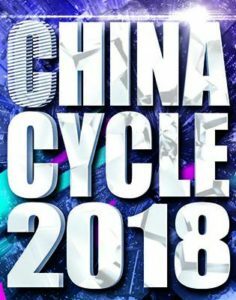 China Cycle 2018, also known as the China International Bicycle Fair, opens this weekend at the National Exhibition Center in Shanghai, and runs May 6-9. The 28th edition features bicycle, e-bicycle, and motorcycle products and services from 7,500 exhibitors. Events include a bicycle photography contest, the China International X Games, kids’ cycling activities, and a cycling fashion show. Be sure to visit ACT Lab in Booth #F0010, located in Hall 6.1 near the Fashion Show. The recently adopted speed pedelec helmet testing standards outlined under NTA8776 that provide enhanced safety over standard bicycle helmets, will now be governed under the new EU Directive 2016/425 on personal protective equipment (PPE), a noteworthy development for EU helmet manufacturers. ‘Speed pedelecs’, also known as S-EPAC bicycles, are electric bicycles that can reach a speed of 45 km/h by pedal assist and are classified as L1e-B two wheel mopeds, and must be pedaled to be ridden. Helmet use is compulsory for speed pedelec riders in the EU. During a one-year phase-in period, helmets that already have NTA8776 certificates can continue to be sold in the EU without issue until April 21, 2019; however, all certificates issued after April 21, 2018 must comply with NTA8776 and EU Regulation 2016/425. Later this month, ACT Lab will participate in ASTM Committee Week in San Diego, California, May 22-24. The meetings, considered the lifeblood of the standards development organization, are organized by field with volunteer expert representatives from across the industries they serve. ACT Lab sits on the ASTM F08.10 and F08.96 U.S. TAG sub-committees for bicycles, and the ASTM F08.53 sub-committee for helmets and headgear safety standards. The upcoming meetings are scheduled to discuss standards for components, wheels, bicycles, helmets, performance safety and more. For more information, please visit ASTM online. Following ASTM Committee Week, ACT Lab will travel to Minneapolis, Minnesota to sponsor and participate in the ISO Bicycle Standards Group Meeting, June 11-15. This international group of engineers, brand representatives and industry experts, which met most recently in Hamamatsu, Japan, will convene in the USA for the first time in six years. Logistical details of the event will be coordinated by Quality Bicycle Products of Bloomington, Minnesota. ISO Working Groups under the ISO/TC 149 Cycles committee will discuss revisions to published and upcoming ISO 4210, 8098 international bicycle safety standards, terminology utilized and outlined under 8090, and the adoption of electric bicycle ‘EPAC’ standards. Participating members are registered under the American National Standards Institute (ANSI). For more information, visit links for the ISO Cycles Committee and/or ANSI. ACT Lab is hiring a full-time sales representative, based in its Taicang ACT, Suzhou, China office. Candidates must possess excellent communications skills and experience in the testing, compliance, bicycle, helmet and/or toy industries is preferred. Click here for more information or to apply today.